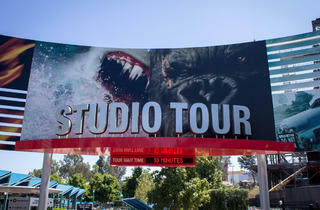 Photograph: Michael JulianoStudio Tour at Universal Studios. 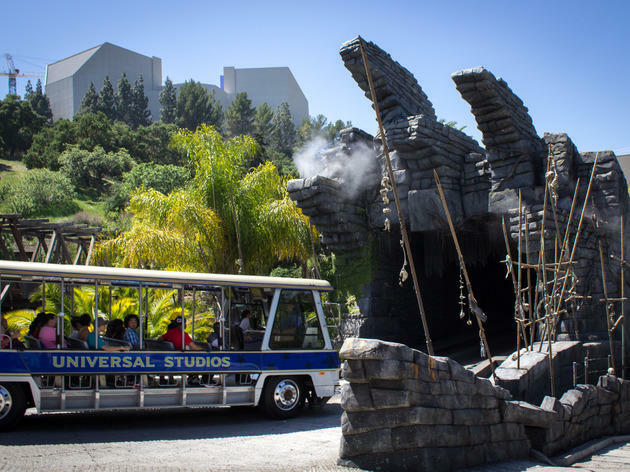 Though the rides lack both Disneyland's charm and the sheer terror inspired by Six Flags Magic Mountain, Universal Studios Hollywood's hillside theme park offers some worthwhile thrills fueled by silver-screen memories and an illusion of Hollywood glamor. There are some real standouts, mostly in the more thrilling lower lot. The Transformers ride is a slick crash course in Michael Bay robot carnage, and easily the best experience in the park from start to finish. Revenge of the Mummy is a short but action-packed ride through a movie property you'd otherwise forgotten. And though Jurassic Park: The Ride isn't quite the magical adventure you remembered it to be as a kid, it's still worth the plunge. 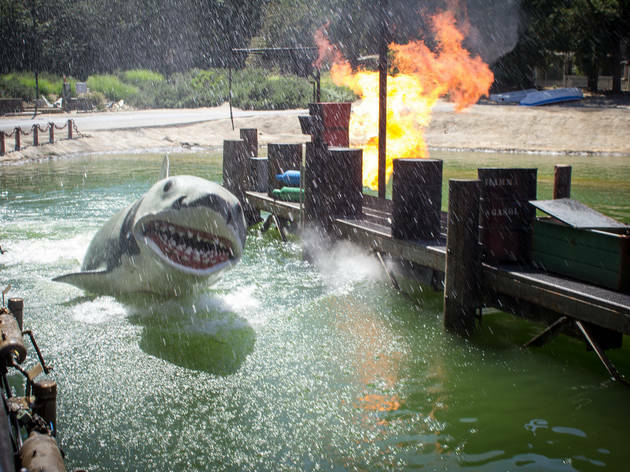 You'll find a mix of 3-D movies and stage shows—bizarrely, Waterworld is highly entertaining—on the upper lot, as well as themed areas and attractions for Despicable Me and The Simpsons. Kids will appreciate Minion Mayhem and the adjacent Super Silly Fun Land, though neither are as charming or exciting as you'd wish. The immersive Simpsons Ride, on the other hand, is a clever and wildly entertaining albeit highly nauseating attraction. The restaurant-filled Springfield nails its Simpsons references but comes up short with its food offerings—in terms of price and taste—and some rather drab interiors. That seems to be the standard here: Everything feels about 80% of the way there, especially when taking into consideration the steep ticket prices. Hopefully the introduction of the Wizarding World of Harry Potter in 2016 willl change that. 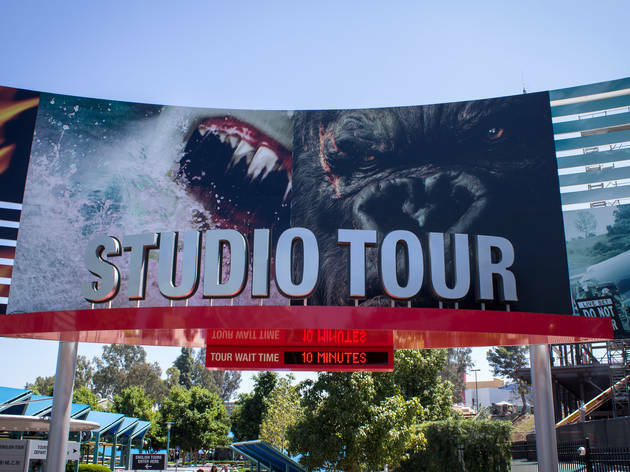 The park's original attraction is also one of its highlights: the studio tour. Most of your time is spent carting through diverse backlot sets of New York, a mutt of European villages, the Old West and familiar movie landmarks—most impressively the 747 crash site from War of the Worlds. 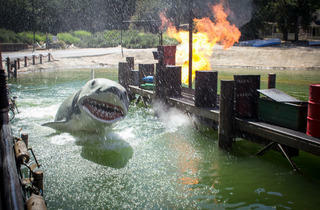 The majority of actual live filming is securely tucked away, but Universal compensates with preplanned encounters that mimic special effects: a wet and fiery earthquake simulation, a sudden flash flood and that delightfully rubbery, toothy grin on the face of Bruce—a.k.a. Jaws. While the 3-D motion simulation that replaced the iconically campy (and burned down) King Kong section is a welcome technical upgrade, the tunnel lacks the same immersion and charm of the original—hopefully the similarly staged Fast & Furious: Supercharged (slated for June 2015) will perfect the formula. Most attractions have the decency to save their souvenir shops until the end. Not here. You can't reach Universal Studios without strolling down CityWalk, a loud, colorful and oppressive pedestrianized street crammed with souvenir hawkers and junk-food retailers. If you've got children, don't be too surprised to find your finances severely depleted before you've even reached the gates of the studios. Hours vary by day: call or check online for full details, incl closing times. Universal Studios: Summer usually from 9am daily. Winter usually 10am-6pm daily. Citywalk 11am-9pm Mon-Thur, Sun; 11am-11pm Fri, Sat. I live here so I know. Come on, people? Having grown in the valley US was always a stone's throw away from anything! I recently got a season pass for $110 from Costco and it was one of the best deals they had! This place has changed so much since I first came here as a kid but absolutely love it. The rides are fun but are quite similar in which they're all the 3D style with the moving seats. Harry Potter castle is a huge draw for this theme park and with the recent night time light show, it just makes it amazing! Universal is the park to go to. You can take the metro. It's reasonable. They have full bars all over the park. Food is amazing. And HARRY POTTER! Get a butter beer you won't regret it. The passes are really affordable and if you live in the area it's definitely worth it. I suggest buying a Gold Pass via Costco. You get free parking, food discounts and almost no blackout dates! Be careful on weekends and during the summer - the park gets very crowded and hot! Ps you can bring a drink on the tram and you definitely should because it's a bit of a long experience haha. Enjoy it! A fun place to go! Shoot for a weekday or even a gloomy (possible chance of rain) day and the lines will be significantly shorter. The park is not incredibly huge and it's not full of roller coasters but they have some awesome special effects rides/tours. I'd definitely recommend the Jurassic Park ride, The Mummy ride and the Despicable me simulator. Also, if you're a fan of donuts- The Simpson ginormous donut is an absolute must (very Instagram worthy). Not to mention the infamous VooDoo donuts that will be located on CityWalk soon. So I'm a super big kid and having been to the Orlando one at the point when I visited I was really looking forward to this! It didn't disappoint for me, as I'm fairly easy to please with things like this. We spent the best part of the day here, wandering around trying out different rides and taking lots of pictures with all of the different characters. My favourite ride was the Mummy ride, scary and thrilling enough to whet my appetite. You won't get much more scarier rides here as its more of an all around attraction and a little less about the rides themselves. At least that's what I gathered. I managed to get pictures with the Simpsons, the minions and various other goodies AND baddies throughout the day. I unfortunately just missed the opening of the Wizarding World here, but have been the Orlando Wizarding world, since coming here so don't feel I've missed a thing. Pop into 'Moe's' in the Simpson world, it really feels like you could be a part of the Simpsons! Try one of their donuts too, they're delicious! Have a go on the Mummy and Transformer rides as they definitely the best on offer. One of the best attractions in LA for me! Probably the only reason why I returned after 10 years was to check out the Wizarding World of Harry Potter! However, it does fall short of the sister resort in Orlando where there is much more going on in terms of the butterbeer, getting sorted, etc. That being said, not too much as changed in the last 10 years. 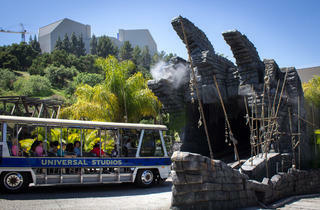 Some classic rides are the Mummy ride and Jurassic park. Unless you're willing to cough up the price equal to that of a plane ticket to somehwere nearby (which I prefer), you'll likely be spending most of your day waiting in line for 30 second rides. Enjoy! You’re still gonna cough up $100 + on tickets, but it might be worthwhile to upgrade to an annual pass if you’re a Socal Resident. It’s like $20 - $30 more for the full year vs just the one day admission. There will be a lot of black out dates, but at least having the annual pass gives you the option to go spontaneously on a Thursday or Friday night. With the new Wizarding World of Harry Potter, there is definitely more incentive to go to the park. (and cheaper than Disneyland). Just a heads up – if your friends who’ve been to the Orlando Harry Potter have told you all these amazing things, believe them, but know that the Hollywood location is WAY SMALLER and not as magical. Two rides only (a Hippogriff one which can be skipped, and the Forbidden Journey one which is a 3D ride). Butterbeer is amazing. The interactive wands seemed to not be too interactive the day I went. It’s still worthwhile to browse the shops in Hogsmeade. For other areas of the park, the Transformer ride is definitely the best. The lockers are also free and keyless which is great if you need to store a bag before a ride. 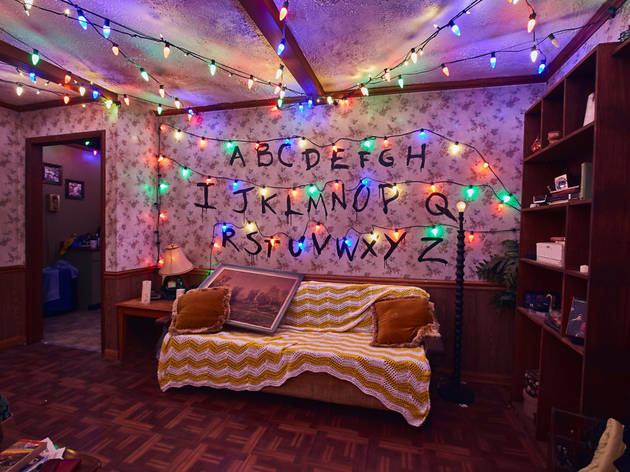 Some real quality rides and good viewing of some iconic hollywood props etc. Very well laid-out especially how you access the lower-level attractions via a few escalators that decend to the backside of the studios. This is also where you take the back-lot tour- a very generous 90 min tram ride that is very fun. Comparable value to Disneyland however it is $$ and there is only one fixed price for entry per person; no child prices.